New tests to help diagnose asthma and a change in how medicines are offered can help people take control of their asthma, NICE has said in new guidance. NICE is recommending objective tests, which include spirometry and FeNO, to help confirm a diagnosis of asthma. This can achieve more accurate diagnosis and therefore more effective treatment, says NICE. FeNO tests measure the levels of nitric oxide in the breath. Increased levels are thought to be related to lung inflammation and asthma. 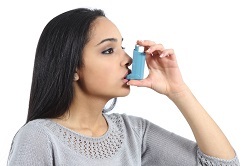 Asthma is a common lung condition that causes breathing problems. The airways become inflamed and narrow, causing breathlessness, coughing, wheezing and tightness in the chest. NICE is also recommending people with poorly controlled asthma be offered a tablet to be taken with a ‘brown or orange’ preventer inhaler before other, more expensive treatments are considered. This is often given in a combination inhaler, which comes in pink, red, yellow, purple or grey, or in two separate devices. However, NICE now recommends they take a leukotriene receptor antagonist (LTRA) tablet before treatment with LABA. This change in the way treatment is offered could save the NHS an estimated £2million a year for every 10,000 people who take up the new recommendation, NICE says.